Sterling silver, real Turquoise, Howlite, Jet, Oyster Shell, and man made Opal. Pendant measures approximately 1-3/4" long (including bail) and 1-3/8" at widest point. This pendant is a true treasure! 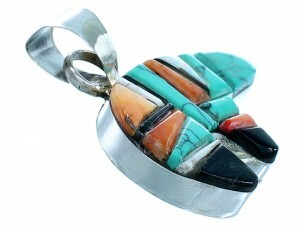 This piece of Native American jewelry is Navajo hand crafted, out of genuine sterling silver, along with multicolor cobble inlay. 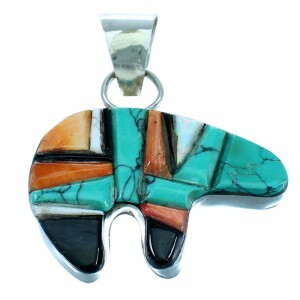 The inlay consists of: real Turquoise, Howlite, Jet Oyster Shell, and man made Opal. The inlay is carefully set, creating a striking bear design for a magnificent finish. In Native American beliefs, the bear symbolizes physical strength, leadership, and is known as the "first helper". 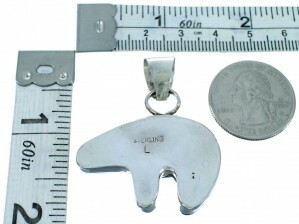 The pendant is stamped steling and hallmarked.